R2841 8484. The monastic site of Dysert O’ Dea is 5 miles north-west of the town of Ennis on the R476 road and then via a country lane heading west to the ruined medieval chapel of Dysert. It stands about 1 mile away from the southern shores of Ballycullinan Lough. The village of Corofin is 3 miles to the north. There is nothing much else here in the way of houses, only a roofless medieval chapel that is built on the site of an 8th century Celtic monastery, founded by St Tola. But, there is a ruined round-tower, a splendid high cross, a holy well and some fantastic medieval stone carvings. A few miles to the north-west Dysert Castle has an Archaeological Centre that traces the history of the area from prehistoric times to the more recent. The name Dysert or Disert is Latin for “isolated place” or “hermitage” so here we have the hermitage of Tola that is sometimes given as Cill an Disirt Tola “Cell of Tola”. St Tola founded the monastery here and was first abbot. He died in 735 AD and is commemorated on 30th March. Nothing is left of the Celtic monastery today – the ruined and roofless chapel probably stands upon the site. Essentially, the chapel is 12th century, though a few bits are earlier. Of interest here is the Romanesque doorway, which has 19 carved heads on it’s arch, 12 of these are human, the others are animals and bird heads. The heads seem to look down in a grim fashion with very blank expressions, but that’s what they are supposed to do. There are another three arches inside that also have carvings and the west-window gable has some very fine decoration. The east window is formed by three tall arches, while the doorway has four arches. 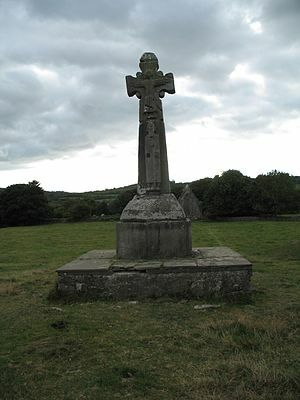 In the graveyard to the east of the chapel stands the 12 foot high St Tola’s High Cross (Cross of blessings) that dates from the 12th century, but was restored in the 17th century with pedestal and square base, and is said to be the finest example of it’s kind. On it’s east face are carvings of Christ crucified and below that a bishop, probably St Tola. On the opposite side there are other carvings with animals and human figures in an interlacing fashion as well as geometric designs, while the pedestal is also decorated. At the north-west side of the graveyard is the stump of a round-tower dating from the 11th-12th century. This was almost destroyed in the 17th century by the soldiers of Cromwell, but originally it was the tallest tower in Ireland at 33 metres high with a circumference at the base of 18 metres. 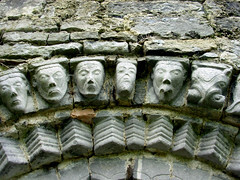 There is an arched doorway facing east, narrow slits and two windows at the west side, one of which is ogee-headed. The monks of old would have used the tower as a place of safety, and as a place for the storage of valuable books and monastic treasures in times of trouble. Today it is only a 5 metres high stump. Near the high cross is St Tola’s holy well, once a place of pilgrimage on the saint’s feast-day, 30th March every year. The well had long been visited by the faithful who had been coming here for hundreds of years in the hope of a miraculous cure, but the well was covered over in the last century, only to be restored again recently in 1986. All in all, a lovely peaceful place to visit with much to keep the antiquarians amongst us, happy and enthralled with the many beautiful Romanesque stone carvings. Categories: Dysert O' Dea Monastic Site Co Clare, Monastic Sites | Tags: Dysert O'Dea Monastic Site in Co Clare Southern Ireland | Permalink.